 Design: WMF Atelier (Fred Danner). Design award: red dot award. The small spoon makes its appearance when it stirs coffee and crema, lending the espresso its unique flavour. It can also be used as a delicate sugar spoon. The espresso spoon is available as a complement to individual cutlery collections or in a neutral design. Merit cutlery has timeless beauty, is unpretentious, yet has some fine details. Only when you hold it in your hand do you appreciate how pleasurable it feels. Thick material and rounded edges give this cutlery a pleasant tactile quality. The protruding knife blade is strikingly formed. The "eyes" on the fork prongs are a stylistic nod to tradition. WMF espresso spoon: perfect for your espresso! Espresso is typically served in small espresso cups after a meal. We have developed a range of elegant espresso spoons to match the cups and enhance the enjoyment of your coffee. The espresso was first invented in Milan around 1900. It is characterised by its concentrated strong coffee taste, although it contains less caffeine than a cup of filter coffee. The volume of a classic espresso is a mere 40 ml, which would be completely lost in a large coffee cup. Therefore it is typically served in small, thick-walled espresso cups together with espresso spoons, which are smaller and more delicate than teaspoons and fit the smaller espresso cups perfectly. Enjoy your after-dinner espresso crowned with its delicious crema together with the WMF espresso spoons – with or without sugar. For such a small spoon to cause such a stir it has to look and feel unique. The WMF espresso spoons have been crafted in such a way that they are a delight to hold and efficient to use. It goes without saying that each or our unique cutlery collections includes matching espresso spoons. Enjoy a complete cutlery range comprising high-quality individual pieces that are designed to last. You can choose whether you wish to buy individual espresso spoons from our range or one of our sets, which each consists of six espresso spoons or mocca spoons. Our espresso spoons have been continuously developed over a long period of time in order to provide you with a unique experience while enjoying your espresso. 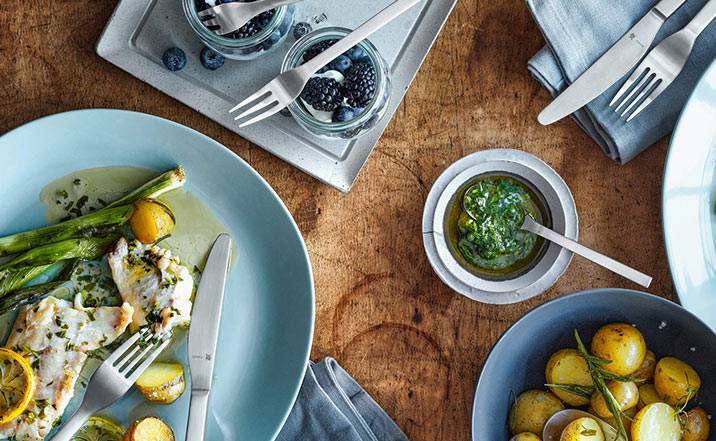 With our Fächer, Merit, Premiere and Augsburger Faden cutlery collections, you can enjoy the highest quality 90g "Perfect" hard silver-plated or 925 sterling silver cutlery. Espresso spoons from the Boston, Denver, Palermo, Palma, Sydney and Taika collections are made from our proven Cromargan® stainless steel 18/10 – they are completely rust-proof and dishwasher safe, which means that you can confidently leave the washing up to your dishwasher after a dinner party. By contrast, Cromargan protect® combines the love for aesthetics with the desire for long life. 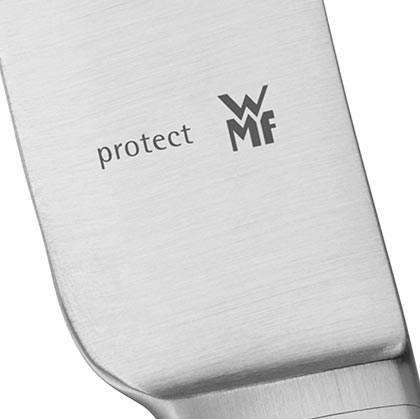 Thanks to its extraordinary scratch resistance and extreme resilience to wear and tear, Cromargan protect® ensures that your WMF espresso spoons will stand the test of time. Be inspired by the WMF espresso spoons and add some high-quality espresso or mocca spoons to your cutlery collection.